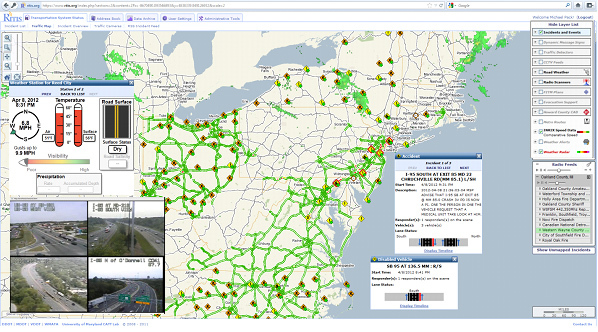 The Regional Integrated Transportation Information System (RITIS) is an automated data sharing, dissemination, and archiving system that includes many performance measure, dashboard, and visual analytics tools that help agencies to gain situational awareness, measure performance, and communicate information between agencies and to the public. RITIS automatically fuses, translates, and standardizes data obtained from multiple agencies in order to provide an enhanced overall view of the transportation network. 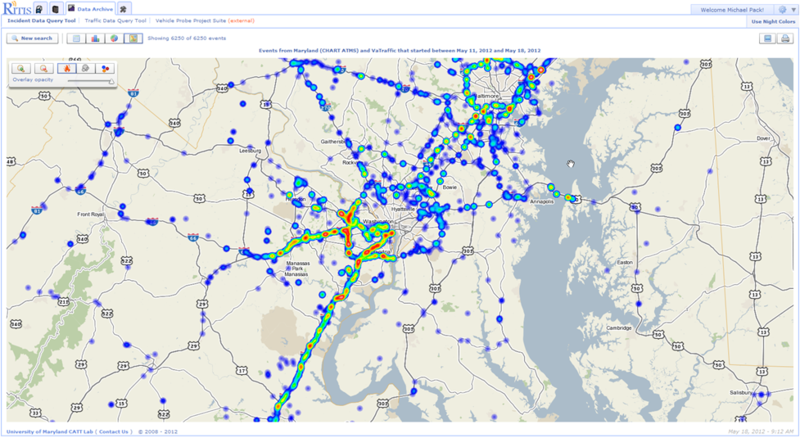 Participating agencies are able to view transportation and related emergency management information through innovative visualizations and use it to improve their operations and emergency preparedness. RITIS also uses regional standardized data to provide information to third parties, the media, and other traveler information resources including web sites, paging systems, and 511. 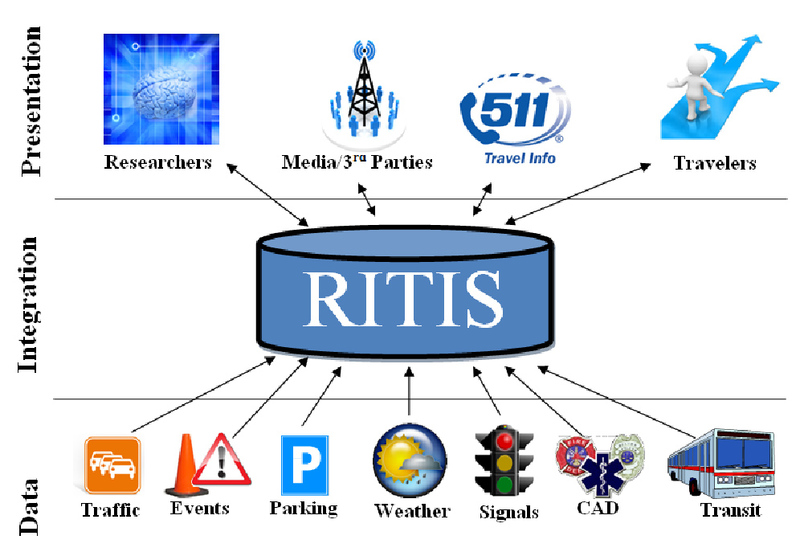 RITIS data feeds are services that provide direct access to real-time incident, event, detector, probe, weather, transit, and other data sources including ITS device status. The RITIS data feeds are designed to facilitate integration of RITIS data back into legacy and third party systems and for 3rd-party application developers that need access to real-time information for dynamic mobility applications. The data feeds provide for implementation flexibility both in data format and retrieval method. The RITIS platform allows each agency to determine which data elements it wishes to provide in the data feed or maintain secure and secluded from other agencies or the public. The RITIS website allows users with appropriate credentials to view all of the real-time RITIS data in a browser. 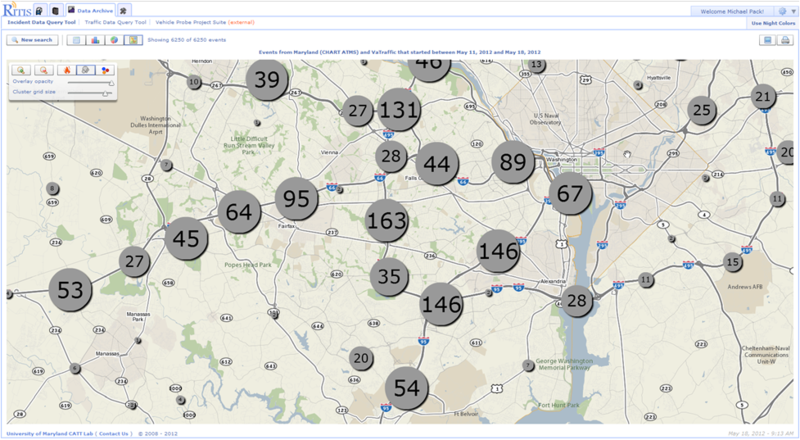 The website provides users with a dynamic set of visualizations and tools that afford efficient situational awareness. 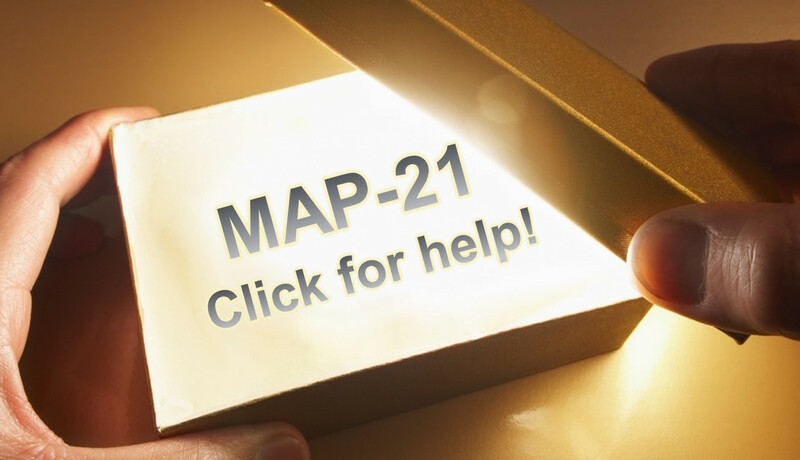 Authorized users can interact with live events, incidents, weather, sensors, radio scanners, and other data sources and devices in maps, lists, and other graphics. Users can apply a rich set of filters, access contact information, and even set up alerts. 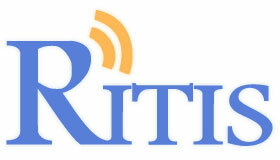 Public safety or DOT employees who wish to get an account to the RITIS platform can do so by visiting https://www.ritis.org/register/ and filling out their contact information. There is no cost to get access. Accounts are not given to the public or the private sector due to the sensitive nature of some of the data. 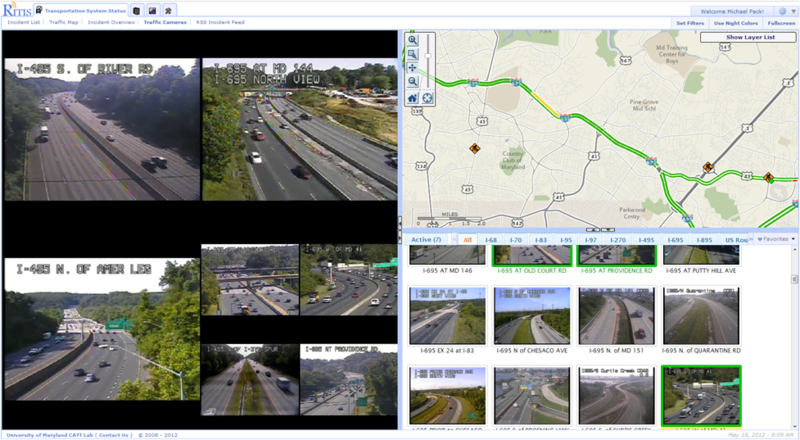 Figure 1: Sample screenshot of the RITIS map showing live video, weather, traffic, and incident information. All data within RITIS is archived indefinitely—meaning that no data is ever deemed “too old” to be removed from user access. A number of online tools have been developed to allow users to query, analyze, and derive performance measures from the RITIS archive. Many of these tools are highly interactive and dynamic. They have been developed with the user in mind and afford a high degree of freedom to explore the data with minimal training needed. Data within the archive can also be downloaded and/or exported so that users can perform their own, independent analysis. 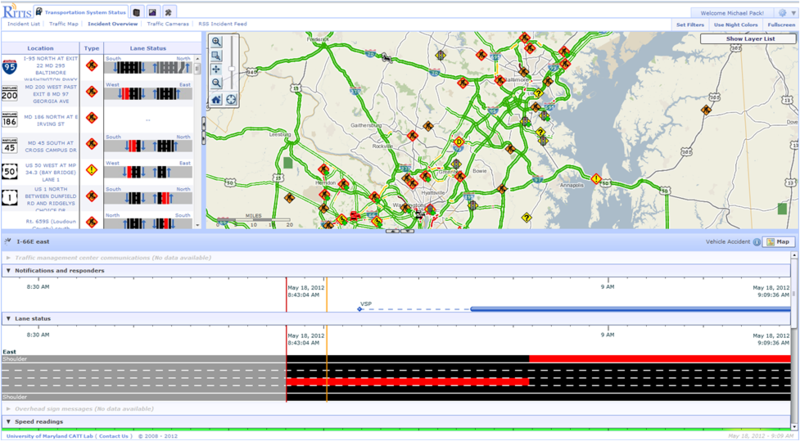 These tools can allow users to identify accident hot-spots, analyze queue lengths and traffic congestion/bottlenecks at specific areas, perform after action reviews, and evaluate the effectiveness of transportation operations strategies. A few screenshots of these applications are included below; however, we encourage you to check out the many additional archived data analysis tools that are featured in our portfolio. 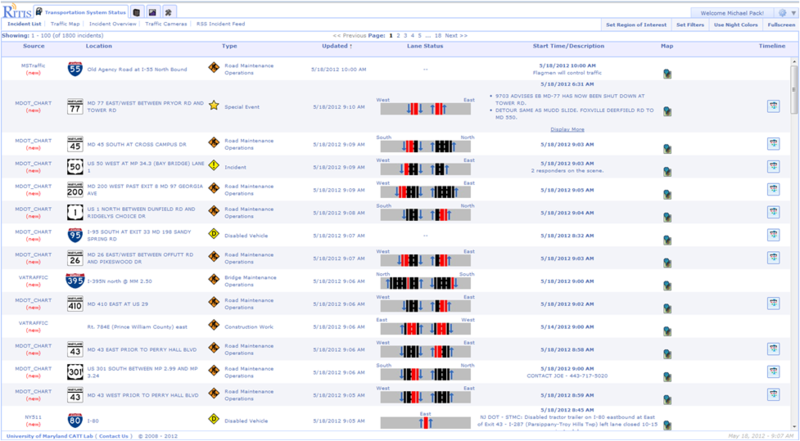 Figure 2: incident charts and graphs can be displayed that show average length of various types of incidents, the number of incidents that occur by hour of the day, incident types by roadway, county, state, the average response time of safety service patrols to arrive on-scene, etc. Figure 3: Heatmaps of incident locations can be rendered with just a few clicks of the mouse. 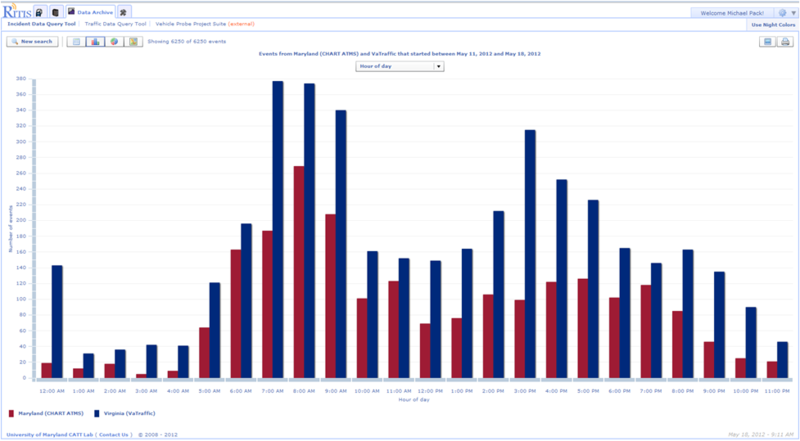 Figure 4: Clustering algorithms allow the user to see how many incidents have occured at specific locations over custom date ranges. 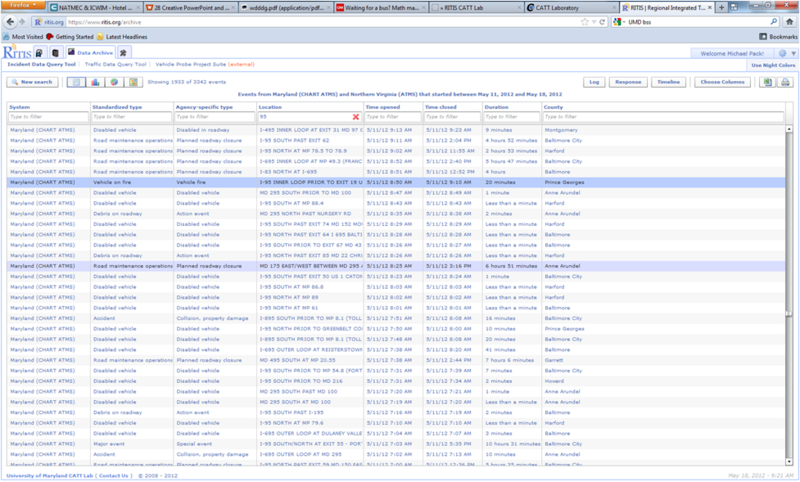 Figure 5: interactive tables allow users to search for specific incidents, filter by incident type, location, vehicles involved, etc. and then create timeline graphics that display how the incident was managed.